We sell Dr Stuarts products like Dr Stuart's Valerian Plus Tea - 15 enveloped bags online in the UK and directly from our award-winning store in Scotland. Valerian root and hops known to help restful nights sleep. Naturally caffeine free tea. Valerian root and hops known to help restful nights sleep. As official Dr Stuarts stockist, we sell genuine Herbal Teas directly from our shop in Scotland and online throughout the UK. Dr Stuart’s created numerous high quality products in the food, medicinal and health sectors, as well as encouraging a resurgence in the cultivation of organically grown plants. View more products from Dr Stuarts. Where can you buy real Valerian Plus - 15 bags safely online? If you are wondering where you can buy Dr Stuart's Valerian Plus Tea - 15 enveloped bags safely online in the UK, then shop with us. We are an actual health foods shop; with real people selling real foods and products. Our award-winning independent shop is located in Stirling, Scotland since 1976. You can buy our Herbal loose teas and other genuine Herbal Teas in store or safely place an order with us online or over the phone. 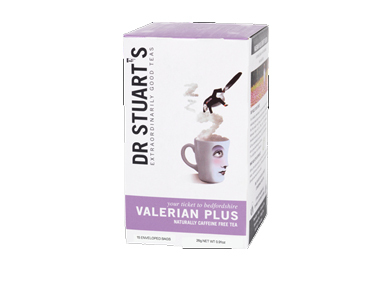 Valerian Plus - 15 bags - Dr Stuart's Valerian Plus Tea - 15 enveloped bags in Herbal Teas and Tea Loose & Bags.